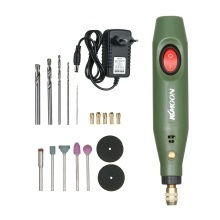 Comes with an electric grinder and 16-Piece accessories, this kit is really good for engraving, cutting, milling, grinding, polishing, removing and drilling. Whether you&apos;re polishing stones for a handmade necklace, engraving a jade, or drilling a vintage jewelry, you&apos;ll appreciate it for its good performance. Portable electric drill, durable and reliable. Very mini size, light weight and comfort grip handle. Applicable to stainless steel, porcelain, stone, glass, plastic, wood, bracelet, etc.